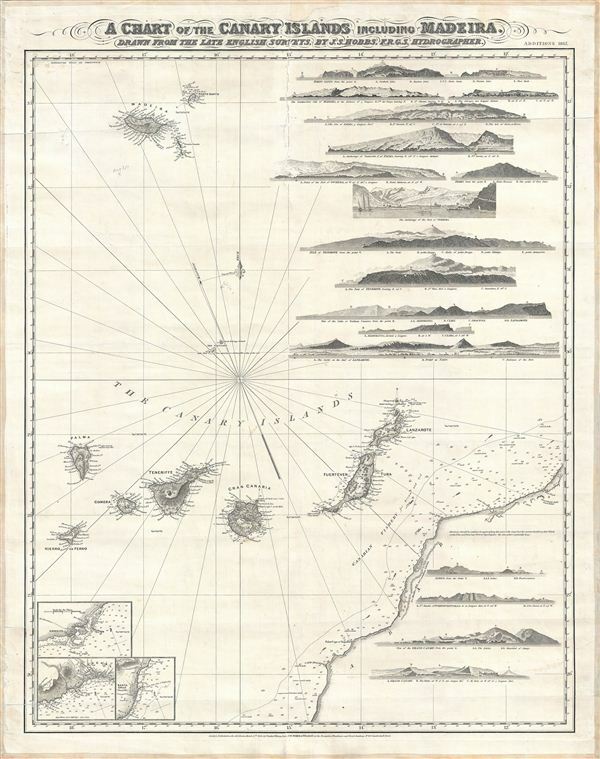 A stunning decorative sea chart detailing Madeira. A Chart of the Canary Islands Including Maderia. An exceptionally beautiful 1867 James Norie and Charles Wilson nautical chart or maritime map of the Canary Islands and Madeira, including part of western Africa. As a whole the map offers excellent detail with inland topography on all of the islands as well as countless depth soundings throughout. There are three inset detail maps in the lower left quadrant focusing on Arrecife, Funchal, and Santa Cruz. There are an additional seventeen land profile charts filling the upper right and lower right quadrants. The title is set in an elaborate typeface just outside the map's upper border. The Canary Islands were a popular stopping point for ships traveling between Europe and the Americas. By the time this map was made, Madeira was known around the world for its fine desert wines, among the most popular luxury beverages in the Western Hemisphere throughout the 17th and 18th centuries. Cartographically this map is based on the work of J. S. Hobbs. It was engraved by Charles Wilson, of 'Norie and Wilson,' a nautical publishing firm based at 157 Leadenhall Street, London. Charles Wilson (1807 - May 16, 1882) was a British-Indian publisher of nautical charts and maps based in London, England. Born in Lucknow, India, Wilson was the son Lieutenant-Colonel William Wilson and his wife Hoosainee Begum, an Indian princess, who was the daughter of the Nizam of Ashrafabad. Wilson was educated in England and worked in the wine trade before joining the Norie firm in 1838. Norie had already partnered with another Wilson, George, who was a nephew to Charles. When Norie retired in 1840, Charles Wilson took over the firm publishing as 'Charles Wilson (Late J.W. Noire and Wilson)'. He married Jane Arabella Bingle on July 1, 1846. Wilson died in 1882 passing the firm on to his sons, George and William Wilson. The brothers merged the firm with that of J. Imray and Sons in 1899 and, as Imray, Laurie, Norie &Wilson Ltd., they continue to publish to the present day. John Stratton Hobbs (September 27, 1813 - December 19, 1874) was a British chart maker, hydrographer, and engraver active in London during the middle part of the 19th century. He was born in London to William Henry Hobbs, a ship-broker, and his wife Eleanor. Most of Hobbs' work was published in conjunction with Charles Wilson and James Norie. Hobbs began working for the firm sometime in the early 1820s in the hydrographic department. As time went on, Hobbs slowly took over the hydrographic department at Norie and Wilson. Though many maps issued by Norie and Wilson do acknowledge Hobbs, it is presumed that his hand was behind an equal or greater number that do not. In 1848 he was elected to the Royal Geographical Society, where he was a member for the remainder of his life. Hobbs married Sophia Colwell on January 20, 1862. Very good condition. Cleaned and re-backed with fresh linen. Split with slight loss repaired. at top center.